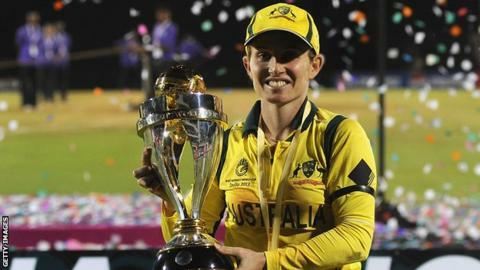 Australia captain Jodie Fields says victory over West Indies in Sunday's Women's World Cup final completed a "great piece of history". A dominant 114-run win in Mumbai means the Aussies simultaneously hold the World Cup, World Twenty20 and the Ashes for the first time. "It's a big achievement, one that we're very proud of," said Fields. "Winning two World Cups in the space of four months is a great piece of history for Australian cricket." The achievement matches that of England in 2009 when they lifted the World Cup in Australia before winning the World Twenty20 and defending the Ashes later that year. Since then, Australia have fought back to win back-to-back World Twenty20 titles, regained the Ashes in 2011 and added a sixth World Cup crown. Jess Cameron, named player of the match for her 75 against the Windies, added: "From 2009 to where we are today, the amount of effort that Cricket Australia has put in to our programme has been amazing. "It really shows in the trophies we've won and hopefully we can win a few more." Key to the Southern Stars' impressive victory in Mumbai was the return of pace bowler Ellyse Perry after three matches out with an ankle injury. After hitting 25 from 22 balls with the bat, Perry took wickets in each of her first three overs, despite twice aborting attempts to bowl her first ball and limping between overs. "I've been battling an ankle injury for about three months, but I've been looked after by our medical staff and I wouldn't have missed this for the world," said Perry, who is also an international footballer for Australia. "It was wonderful to play the way we did, a really special day and something I'm privileged to be a part of." Australia are now looking forward to defending the Ashes in a one-off Test match against England in Wormsley in August. Skipper Fields added: "We'll go home, have a well-earned rest and then we'll be able to focus on that Ashes tour. "There's not many Test matches that we get to play at the moment, so that's a big thing for international women's cricket."